Pest Control: Which Pest is it? Wasp or Bee? When you are out in your garden, you may wonder which of the flying critters that you swat away from you are actually pests and which are essential to the health of your garden. Frequently, labeling an insect as a pest is a case of mistaken identity. We know that most of you don’t want to kill something that is actually beneficial to your garden, so in this week’s article, we’ll cover a few of these confusing bugs so you can know which ones to focus on ridding your garden of, and which ones to leave in peace. When you discover that what you are dealing with is a bona fide pest, be sure to call Colorado Pest Management for effective, but environmentally friendly pest control. Wasps are nasty creatures and can take over your yard, sending you and your family scurrying inside on the nicest of evenings. Bees, on the other hand, are a keystone species and essential for human existence. Distinguishing between these two is important because you don’t want to kill a bee and we’ll explain why. A honey bee is about a half an inch and has fuzz on its body. It has a yellow and black-striped body, but the yellow is a soft yellow, more like the color of the delicious honey they make than a warning yellow. Honey bees are generally very docile. They are generally not aggressive unless the beekeeper is harvesting the honey, which is their winter food supply so you can understand why they would defend it. Their wings are in proportion to their bodies. You will often see pollen sacks on their legs. Honey bees have barbed stingers so when it stings, the stinger, with its guts attached, are lost and so it dies. Honey bees cannot sting multiple times. If you’ve been stung more than once, it was not by a honey bee. Depending on which subspecies of wasp is in making your yard inhospitable, the size can vary from a ½ inch to 1-½ inch long. See below for more way to differentiate between wasps. The yellow on wasps is far brighter than on honey bees. Wasps do not carry pollen on their bodies. Their wings are longer, reaching the length of their bodies. Wasps are inexplicably aggressive, which has earned the epithets that are NSFW. Wasps have barbed stingers and can sting multiple times. Some of the most common subspecies are yellow jackets, paper wasps, and European wasps. Yellow jackets will fly in a back and forth pattern before landing. There can be up to 5,000-15,000 yellow jackets in a nest. Yellow jackets don’t like paper waps so if you hand a decoy paper wasp nest in spaces such as garages and attics; this can help deter their colonizing that space. Hornets are easy to distinguish because they are so much larger than other wasp species. They can be up to two inches long, and while they are not as aggressive as yellow jackets, it is unwise to mess with them. 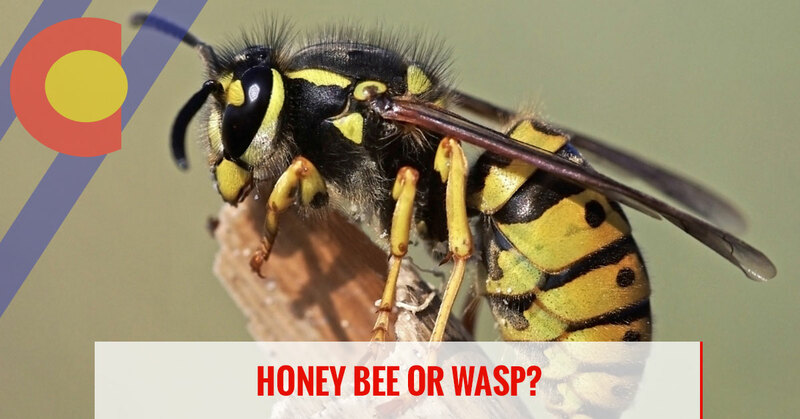 While these are scary- looking wasps, they are actually quite beneficial to your garden so unless you have a nest close to your house, just let them do their thing among your flowers. European wasps are very similar to yellow jackets and can be distinguished from yellow jackets by their narrow waist and their tendency to hang their back legs as they fly. Wasp traps can be put out in early summer. If you discover that you have a wasp nest, or a bee hive on your property and want it moved or destroyed, call Colorado Pest Management. We will move the beehive to a safe spot and can destroy wasp and hornet nests. Call today for garden pest control.